For years, Volvo has tried to shed its image of stodginess and safety-obsession. The company’s latest attempt to inject some style into its lineup is the V40 which, thanks to some leaked photos, hit the Internet well before its scheduled March 6 unveiling at the Geneva Motor Show. 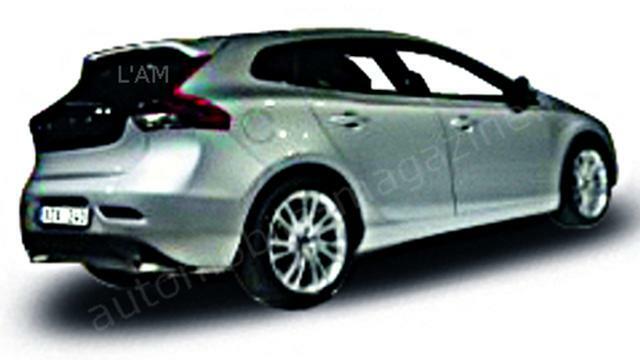 Volvo initially teased the media with silhouette photos, only showing that the V40 was a two-box wagon or hatchback. However, photos released by French car magazine L’Automobile confirmed that it is a five-door hatchback, with curvy rear-end styling that seems to take cues from Volvo’s C30 hatchback and XC60 SUV. Additional photos from autoblog.nl show the front end, which bears a family resemblance to the S60 sedan. The V40 has more streamlined features, though; the hood is longer and the windshield is more steeply raked. The V40 will be powered by a range of engines between 1.4 and 2.0-liters in size. All-wheel-drive will be optional on every trim level. Befitting the company that invented the three-way seatbelt, the V40 will also be packed with safety technology, including Volvo’s City and Pedestrian Safety, which can automatically brake the car at low speeds. Volvo sees the V40 as a competitor for premium small cars like the BMW 1-Series and Audi A3. Unlike regular small cars, the 1-Series and A3 rely on features, style, and brand snobbery as much as they do on price. The V40 will cost 26,000 Euros, the same as the two Germans. Size wise, the V40 slots between the compact three-door C30 hatch and the midsize V60 wagon. At 177.2 inches long, it’s a foot longer than a Volkswagen Golf. An A3 is also much shorter, at 169.0 inches, as is the redesigned 2013 1-Series at 170.2 inches. The Volvo’s larger size will definitely make it the most spacious. Sleek styling and generous interior room make the V40 seem promising, but this is not the first time Volvo has come out with a premium compact that looks good on paper. The second-generation S40 sedan and V50 wagon (which the V40 will essentially replace), were supposed to attract younger buyers with their Mazda3-derived chassis. Unfortunately, the styling was too staid and the performance was lacking. The C30 was meant to evoke the classic P1800ES, but instead of becoming retro-chic like the New Beetle, it was largely ignored. The failure of those models may be why Volvo is not offering the V40 for sale in the U.S. The weak performance of its German rivals may be another; both cars have much higher sales in Europe. Americans have yet to completely embrace the idea of a premium compact; trying to convince them that a Volvo can be cool at the same time might be a bit too much for even the best public relations department.